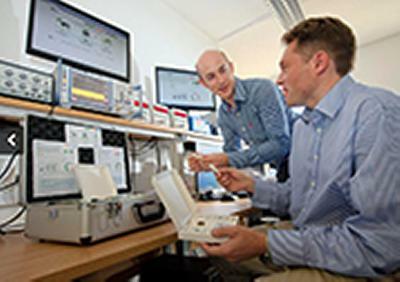 A pioneering project by the University of Southampton, which aims to improve energy efficiency in the home, has won the British Gas Connecting Homes Startup Competition. Dr Reuben Wilcock and Professor Alex Rogers, from Electronics and Computer Science, won first prize for MyJoulo at an event which saw 25 companies from around the world pitching innovative products and services in the home energy sector. As well as the award, which was presented by Baroness Martha Lane Fox of lastminute.com, the researchers received a cash prize of £30,000 and the chance to run a trial with selected British Gas customers. MyJoulo is a simple process, which provides personalised energy-saving advice with the minimum of time and effort – and at no cost. Only three steps are involved in the process: first you register with the project online and you receive your free Joulo data logger (which looks and works just like a conventional memory stick). You place this on top of your central-heating thermostat and leave it for a week to collect data as you continue to use your heating as normal. You then upload the data from the logger to a website to receive instant personalised advice on how to reduce your heating bill.